Tallan provides BizTalk Server consulting services including installation, configuration, ESB architecture, BizTalk development, performance analysis, and training. Our BizTalk consultants provide the best practice standards and patterns for each client, and we prepare and train your internal staff to support the solutions we deliver. Our comprehensive team of experts simplifies the integration of processes between your internal systems and those of your business partners. Systems integration can improve business agility and speed to market while leveraging reusable architecture that saves cost. To explore and understand your unique business needs and resolve pain points, Tallan technologists work with you to develop a personalized strategy and envisioning workshop that lays the foundation for a successful project. Tallan has a dedicated BizTalk Server team that focuses solely on BizTalk upgrade, installations and configurations. This dedicated BizTalk installation team can also set up and configure automated deployments, utilizing BizTalk Deployment Framework (BTDF). Leverage our team of certified database development and management experts to work with your infrastructure team. Our team can assess existing server configurations and make recommendations to improve fail-over, latency, and over encumbered deployments. Whether its BizTalk Azure hosted as IaaS (infrastructure as a Service), iPaaS (Integration Platform as a Service) or Hybrid Cloud, leveraging BizTalk Server 2016, Azure BizTalk Logic Apps or Azure Service Bus, Tallan’s integration architects can help implement a cloud-based solution that is right for you with our unique IP – Tallan’s Cloud Decision Matrix. Our dedicated BizTalk Support Team can monitor and remediate issues as they come up, and proactively predict issues before they impact your business. We can also support integration projects NOT implemented by Tallan. Tallan is one of Microsoft’s most trusted integration partners, we work with Microsoft Technical Specialists, account executives, and product teams to ensure seamless execution. Don’t take risks with offshore and lone-wolf independent consultants. At Tallan, our clients benefit from the collective experience and support of the entire Integration Practice. Our BizTalk expertise goes back to the very first release and has continued through versions including: BizTalk 2002, BizTalk 2004, BizTalk 2006, BizTalk 2006 R2, BizTalk 2009, BizTalk 2010, BizTalk 2013, BizTalk 2013 R2, and the latest version – BizTalk 2016. The team also has extensive experience with BizTalk integration models, patterns, and practices including: BizTalk ESB, Message Broker, SOA, Aggregator, Content-Based Routing, and Microsoft BizTalk Business Rule Engine. Tallan offers BizTalk specialists in dedicated roles including BizTalk Technical Project Manager, BizTalk Senior Consultant, BizTalk Consultant, and BizTalk Architect. Regardless of complexity or budget, every project or new integration interface goes through our elite team of BizTalk Architects. BizTalk is built for the masses. Tallan’s T-Connect EDI Gateway is a suite of BizTalk Accelerators that fill the gaps in EDI and HL7 BizTalk deployments. Large EDI File Handling: Our T-Connect patterns can process large files quickly and correctly. Slow Processing: Process EDI on day 1! 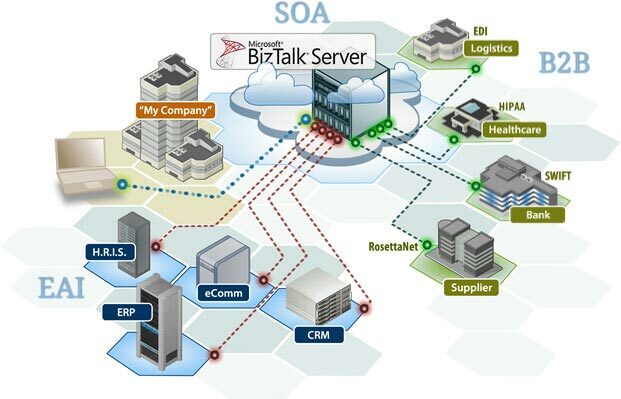 Blueprint BizTalk EDI Solution is based on our T-Connect Accelerator solution and provides inbound/outbound solutions out of the box. Inability to Track Lifecycle of EDI Transactions: T-connect enables persistence points in the consumption of the transaction. Limited Transparency: T-Connect Clarity package provides dashboards, reports, and consoles to better manage the processing of your EDI files and leverage their data to make business decisions. Tedious Trading Partner Onboarding: Simply point to the EDI sample file and onboard trading partners in minutes. Store BizTalk EDI messages using our set of pre-built database tables, views, and procedures. Already a BizTalk user, or want to learn more about what BizTalk 2016 has to offer? This informative webinar will take you through advantages of the Hybrid Integration Platform, 100s of available connectors, enhanced speed and security. Tallan's top technologists share their thoughts on the latest technology challenges, opportunities, and platforms. Set up an Envisioning Session with our BizTalk Experts Today!